ClinGen Epilepsy Gene Curation Expert Panel. For the past year I have been a member of the ClinGen Epilepsy Gene Curation Expert Panel, which has been a rewarding professional experience. I have gotten to know several colleagues within the epilepsy and ClinGen communities, I’ve become familiar with resources for gene curation including MONDO and HPO, and I’ve dived deeply into the existing literature linking genes with a broad spectrum of epilepsies. But working with ClinGen has had another unexpected benefit – it has influenced my approach to writing scientific manuscripts. I have been able to apply this knowledge recently when writing a manuscript about a new causative gene for developmental and epileptic encephalopathies. In this post I would like to share five insider tips about what to include in your genetics manuscript so that it can receive full consideration from the ClinGen Epilepsy Expert Panel. Worlds drifting apart. We currently use two different concepts when thinking about genetic epilepsies. The traditional ILAE phenotypes are based on the evolving ILAE classification that is increasingly integrating genetic entities into its classification. This is the domain of historical classifications, a separate tradition about lumping versus splitting and extensive knowledge on genotype-phenotype correlation. Unbeknownst to most of us, however, a different classification is emerging that is mainly based focused on aligning and improving the diagnostic work flow in a genetic lab, which is coordinated by the ClinGen Consortium. This is where MONDO classification, Human Phenotype Ontologies (HPO), and ACMG criteria come into play. While this competing classification concept may seem superfluous at first glance, it is important to note that most genetic test results in patients with epilepsy are based on these classification in a diagnostic setting. Our current concern is that both worlds are increasingly drifting apart. 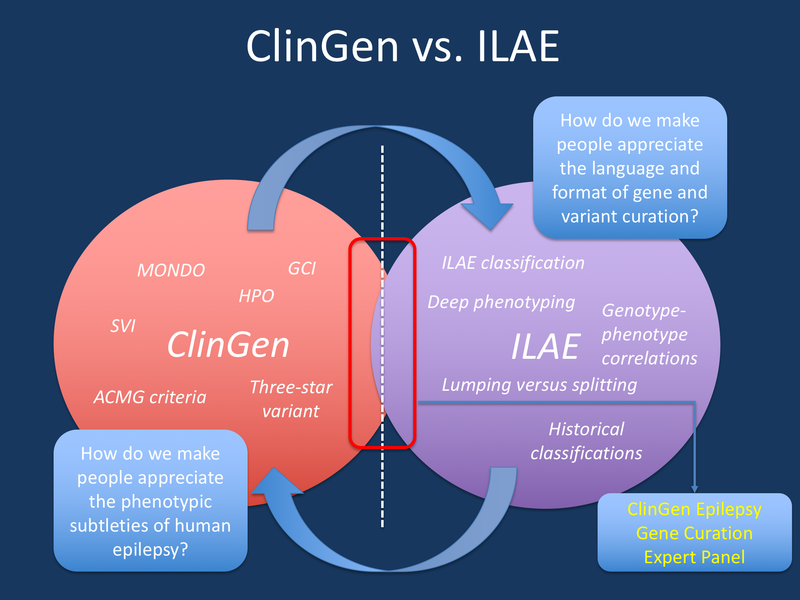 Within the ClinGen Epilepsy Gene Curation Expert Panel, we are trying to align both classification systems to make sure that our clinical epilepsy knowledge is adequately translated into the concepts that are used in a diagnostic setting. The task of the ClinGen Epilepsy Expert Panel. A major task within the Expert Panel is to critically evaluate existing scientific literature to assess the strength and validity of an association between a given gene and a disease. We review individual published cases with variants in a specific gene and award a range of points based on the strength of the evidence. A critical point is that ClinGen can only evaluate evidence that is in the public domain. We are not able to ask authors to provide us with additional information, so it is essential that authors provide all relevant information in their publications. 1 – Tell us how you found the variant. This may sound obvious, but please tell the readers what methodology you used to identify the genetic variants in the patients in your manuscript. If the methodology includes targeted sequencing of single genes or a panel of genes, please tell us how many, and ideally which, genes were sequenced. If the variant was identified using chromosomal microarray, provide the readers with information regarding the number of probes used. Unfortunately, cases may be awarded few if any points in ClinGen curations if the paper does not tell us how the patients were sequenced. When providing information regarding sequencing methodology, be as specific as possible. 2 – Were parental relationships confirmed? This is especially relevant for the epilepsies, which are often the result of de novo variants. We cannot award the full amount of points if the parental relationships – both mother and father – have not been confirmed. Trio-based whole exome sequencing studies confirm parentage inherently, but for singleton exomes, gene panel, or targeted sequencing studies a second method of confirmation is needed. Sanger sequencing of the variant to confirm de novo status is insufficient. Usually another method, such as Short Tandem Repeat (STR) analysis, is used to confirm parental relationships. If this has been done, please mention it in the manuscript so that we can award the maximum amount of points. If parental status has not been confirmed, a reduced number of points can still be awarded. For autosomal recessive disorders, please note whether or not the variants were confirmed to be in trans. Failure to note this may mean that we cannot award any points for biallelic disorders. 3 – Please include genome build, genomic coordinates, and relevant transcript. This applies for single nucleotide variants but is especially true for deletions, duplications, and balanced translocations. Cases with balanced translocations and CNVs spanning a single gene can be included in a gene curation provided that both the genome build – e.g. hg19, GRCh37 – as well as the deletion/duplication/translocation breakpoints are included. Oftentimes one or both of these pieces of information are missing, which means that cases cannot be included in the curation and no points are awarded. I will also add in here to please always include the transcript of interest – e.g. RefSeq or ENSEMBL identifier. 4 – Let us know what, if any, prior genetic testing has been done. If additional genetic testing has been performed prior to the identification of the causative variant, please provide this information in the manuscript. An extensive genetic workup indicates to us as curators – and readers – that the association with the gene is strong and allows us to award more points. However, if a detailed genetic workup has not been performed, this is equally important for curators and readers to know, and we may adjust the amount of points awarded accordingly. 5 – Provide as much phenotypic information as possible. This may also sound obvious, but it is also crucial. If a patient in a paper is not indicated to have epilepsy then he/she will likely not be included in an epilepsy curation. More detailed clinical information will also enable our Expert Panel to delineate key phenotypic features of specific genetic epilepsy syndromes. Summary. Including all these elements in a manuscript is of course no guarantee that your paper will sail effortlessly through the peer review process. However, if these five elements are all included, it will ensure that, once published, all cases in your manuscript can be considered for maximum points when we curate the validity of the gene-disease relationship within the ClinGen framework. These tips apply only to genetic evidence, but ClinGen gene curation also awards points based on experimental/functional evidence. In a later post we can provide advice about how to achieve maximum points from ClinGen gene curation for experimental manuscripts. This entry was posted in 2018, ClinGen and tagged ClinGen, Scientific writing. Bookmark the permalink.